Heiser secures win while Edwards locks up Angler of the Year! 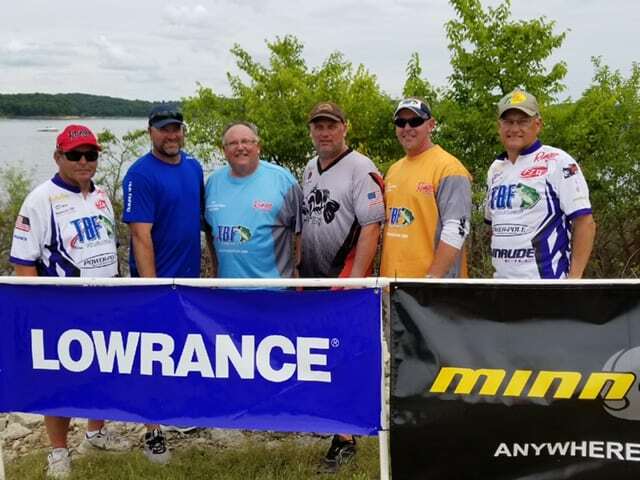 A smaller than expected field accepted the challenge that is Truman Lake in the second Missouri TBF Qualifier on June 3rd and 4th at Long Shoal Ramp. Water levels and current flow were the story of the day with lake levels falling from 25 feet high to “only” 14 feet above normal pool over the prior weeks. With lots of flooded trees and bushes the shallow bite was tempting for lots of anglers but with all the green leaves gone and falling water levels this bite proved inconsistent at best. Instead, most of the successful anglers also focused on main lake structure and current flow to supplement their bite and/or upgrade their catch. Long time Truman expert Don Heiser showed his consistency by bringing the only 10 bass limit to the scales for a total of 20.41 pounds. Don caught multiple keepers each day and culled his way to first place by focusing on main lake points early with Carolina rigs and jigs. His early fish would often be Spotted bass which he would later attempt to cull with the heavier Large Mouth bass. The final boater slot was secured by Mick Maples with 17.11 pounds fishing the main lake area. Mick caught most of his fish shallow flipping flooded willow trees and bushes. He showed his versatility on Sunday though by catching his key fish dragging deeper cover and even targeting suspended fish with a jerkbait! The non-boater field was a tight race with the win secured in the last hour of Sunday by new comer Stacey Stracke. Stacy is new to TBF but a very accomplished angler as proven by his first-place co-angler finish and third overall weight of 17.14 pounds. He had good partners each day and enjoyed the last hour flurry with Ken Whitfield that helped him finish out his last day limit. The second-place co-angler was experienced Truman angler Troy Ladehoff. 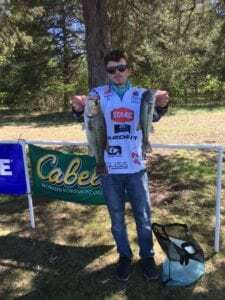 Troy used the “big bass” approach to his tournament with a total of 15.05 pounds anchored by co-angler big bass on both Saturday (4.34) and Sunday (4.43). The final co-angler spot was secured by Roger Edwards who overcame a rough first day (i.e. lousy boater) to find 5 fish on Sunday for 9.77 pounds. Roger fished around the main lake and found his fish relating to current. 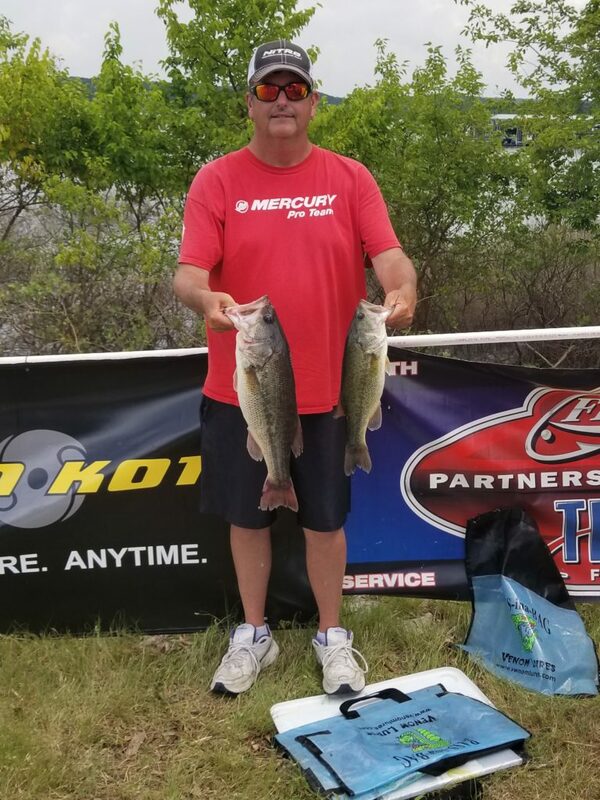 Several other anglers enjoyed individual success with Tom McGovern taking home big bass on the boater side Saturday and overall with a 5.4 pound kicker. It was his first event with the TBF and he finished in 4th place overall on the boater side with 15.3 pounds. The Angler of the Year race was also decided at Truman and in a very close race Roger Edwards squeaked past Brad Tyer and Mick Maples by only 2 points to secure the win! 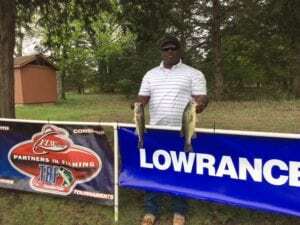 His win was even more impressive given he fished the first event as a boater and due to boat problems had to adjust and fish Truman from the back of the boat. 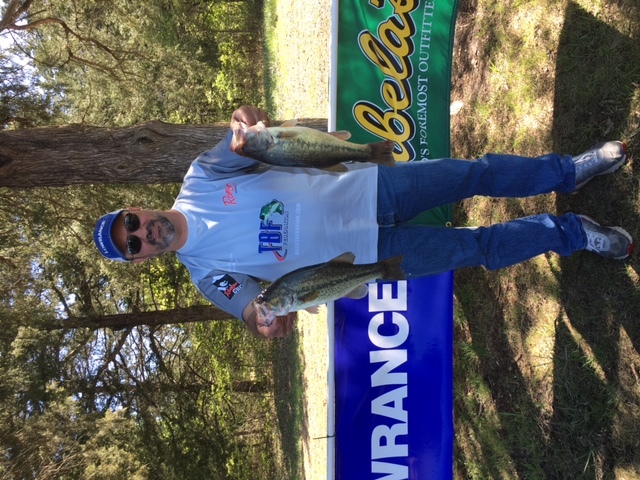 Roger is a long-time member and recently represented Missouri admirably at the TBF National Championship at Table Rock Lake. Rounding out the top 5 were Don Heiser and Greg Lampton who finished just a few points off the pace. 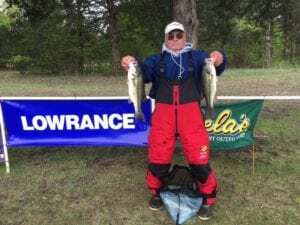 Anglers were greeted with a frigid start to the season at Pomme De Terre lake for the first of two Missouri TBF Qualifying tournaments. The two-day event began with heavy rains on Thursday and Friday for practice and a cold shower for take-off on Saturday with temperatures hovering around 40 degrees. This represented a drastic change from the warm spring weather with water temps dropping from near 70 degrees mid-week to 62 degrees over the weekend. Clouds and intermittent showers was the rule of the day with gusty winds from the North-Northeast right up until weigh-in. 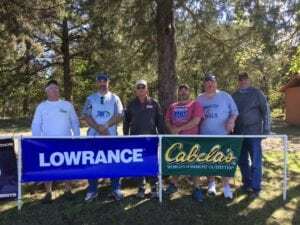 Of course with a strong field of 31 anglers (boaters and co-anglers) someone was bound to figure the pattern out and 14 limits were weighed in on Saturday led by Jerry Lovell’s 13.93 pound sack. Big bass for the day belonged to Greg Lampton with 4.04 pound pre-spawn female. Sunday challenged the anglers with completely different conditions, high bluebird skies with little wind. While the morning started out cold, it warmed quickly through the forties into the 60’s by weigh-in. Several of the anglers made the right adjustments with 4 limits being weighed with the big sack belonging to Patrick O’Neal at 13.78 pounds. Big bass was weighed by Kenny Shinn at 5.01 lbs. followed in a close second by Patrick at 4.98 lbs. For our Boaters, consistency was the key as they were the only ones to produce 5 fish limits each day. 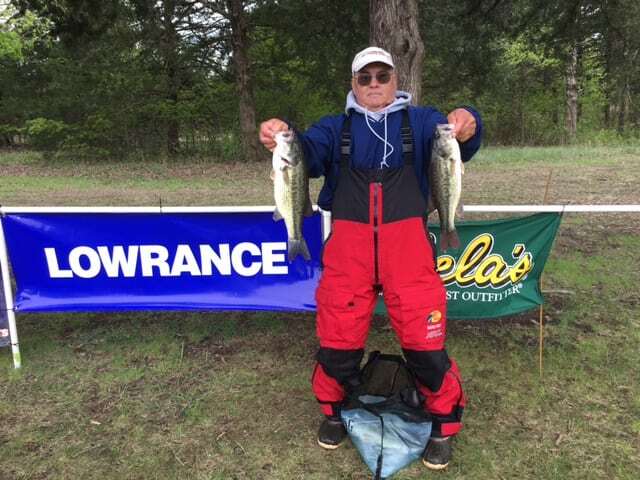 Leading the field at the end of this weather challenged event was Jerry Lovell with a two-day total of 10 fish for 25.39 pounds. Jerry focused in the clearer water within 3 miles of the dam. On the first day he caught 9-10 keepers using a spinnerbait and jig in shallow bushes to catch pre-spawn fish cruising for beds. On the second day he made the right adjustments and fished the same area with a Carolina rig lizard in 12-16 foot of water. While keepers were a little harder to come by on the second day his consistency lead him to the victory. 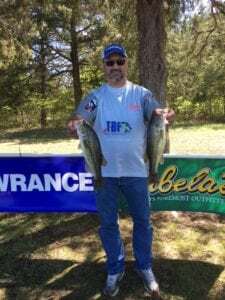 Finishing second on the boater side was Faron Morris who also keyed into the shallow, clear water bite on Saturday using a 5/16 oz. brush hog and magnum finesse worm on a shaky head. He boated 13 keepers which allowed him to cull up to the second largest first day sack. On day two he caught 4 of his 5 keepers early in deeper water (10-15 feet) in the same area. His final keeper came later in the day as he focused more on the brush piles instead of the bushes which completed his solid limit. Rounding out our Qualifying field in the third place was Tim Merck. Like the first two anglers, Tim concentrated in the coves near the dam but focused on suspended, cruising bass using a Ned rig. He focused on water depths of 6-12 feet, swimming the rig to produce 8 keepers on Saturday and 9 keepers on Sunday. 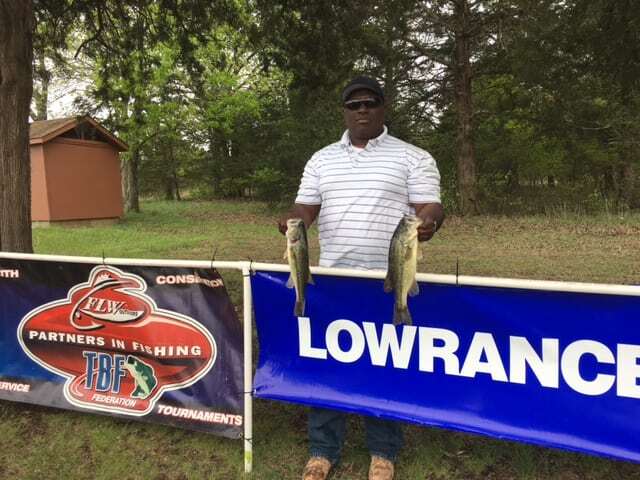 Tim was the third angler to boat a limit on both days and finished 3+ pounds ahead of the 4th place angler. On the Co-Angler side we had a tight race from the beginning. 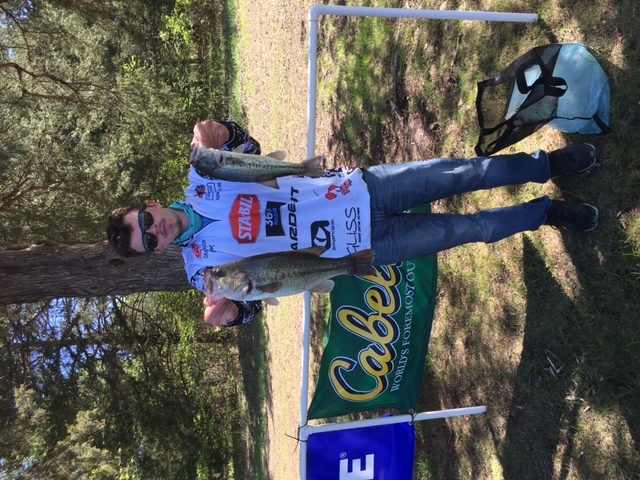 Leading after day one was Troy Ladehoff with 5 fish for 10.35 pounds. As we’ve come to expect, the changing conditions and inherent challenges of fishing as a co-angler shook up the standings on Sunday. Our first place co-angler was Gary Martin with 8 fish for 15.18 pounds (with Co-Angler big bass of 3.80 pounds). He not only adjusted to the weather but also to his boaters by catching fish both deep and shallow. Second place went to one of our newer co-anglers, John Hodson with 7 fish for 14.65 pounds. Troy Richter took the final co-angler slot for the National Semi-Final by using a weightless Senko to target shallow fish in the bushes and avoid the moss-covered rocks/bushes. His total of 6 fish for 12.85 pounds, finishing just ahead of the first day leader Troy Ladehoff who had 11.61 pounds. We would like to thank all the boaters and co-anglers for competing at our first Qualifier. With new leadership at the state level, the officers appreciate all the help and support we had from the members at our first tournament. The sportsmanship shown by all the anglers with the new tournament format was also greatly appreciated. Finally, the Missouri TBF welcomed several new members and enjoyed the opportunity to get to know Andy Price, Josh Moore, Jon Nichols and Don Campbell.